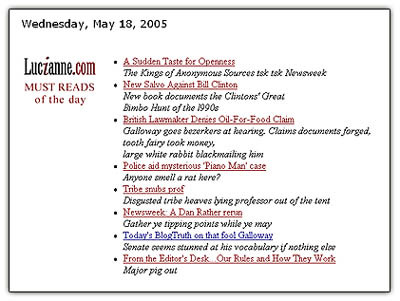 sisu: Galloway claims "tooth fairy took money"
Galloway claims "tooth fairy took money"
"Today's BlogTruth on that fool Galloway: Senate seems stunned at his vocabulary if nothing else," writes Lucianne, honoring us with a link in her "MUST READS of the day" this morning. "Galloway goes bezerkers at hearing. Claims documents forged, tooth fairy took money, large white rabbit blackmailing him." Nobody says it like Lucianne. Great post! This post has given me a lot to think about as well.